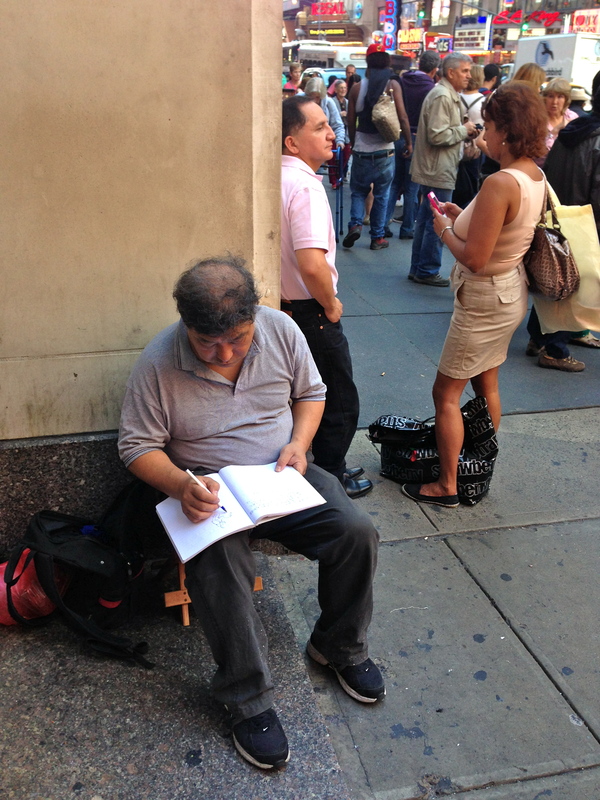 This guy was sketching in Times Square, without a care in the world. Let’s all be more like this guy. There’s a lot of pressure to do it all, be the best you can be, push yourself to your limits, go, go go until you’re exhausted and then go a little more. “I really don’t work that much,” a friend of mine keeps protesting. He works one full-time job, is part of three or four volunteer organizations and freelances for (at last count, and I never can) two or three websites. Right. Not that much at all. So is it any wonder we, as a society, are so stressed out? I think a lot of it is internal as much as it is societal. Every time I take on a new project, I’m reminded how deeply, often self-destructively competitive I am. It’s not enough to have just finished editing one book, elbows-deep in another, working on a new freelancing project with a dear friend of mine and pitching a couple of others, in addition to my day-job as editor of a newspaper. Oh no. I have to have a total crisis of confidence when I find out that aforementioned friend is currently (gasp in horror with me, ready?) writing more pieces and working on more side projects than I am. He’s much more reasonable than I am, see. Because I’ve been racing against the clock, the world, anything, anyone I can find, I forced my way out of the womb 3 months early, in my haste to beat the first odds the world presented me. Let’s stop it, everyone. Let’s just stop it before we all die of heart failure before 40. Because the universe tends to give us what we need when we need it, if we’re receptive enough to receive it, one of my favorite websites posted this article the day I was grappling hardest with my ingrained competitive spirit. It’s a fantastic, grounding discussion of why being the busiest person on the block is no virtue. There’s no prize for the biggest under-eye circles, come to find out. But see, I’m a slow learner. So I needed an additional reminder that pushing ourselves as far as we can go and then just a little bit further doesn’t mean we’re better than the guy who knew his limits and stuck to them. A friend posted this equally awesome article about those “fit-spiration” photos we’re all seeing all over the place lately. The author dissects the body-shaming, self-hate promoting and blatant ableism of those statements, going beneath the intent to inspire to the real meaning and dangerous ramifications they actually hold. And I realized that my need to do more than my busiest friend isn’t about competing with him, at all. It’s about not feeling like I’ve done enough, until I’m completely tapped out because of that delicate balance between my own ingrained Type A personality and society’s barrage of messages that, if we’re not exhausted, we’re not trying hard enough. I don’t think it’s just me, either. Contrast the Xojane.com article above with the advice in Sheryl Sandberg’s book “Lean In.” Although it’s got a lot of empowering, female-forward advice on getting ahead in the rat race, Sandberg has drawn a lot of feedback and outright criticism for her borderline-militant approach to work life or even life as a whole. Sandberg doesn’t actually say women should work as hard as the boys, or that we should give up everything we’ve got to get ahead at work. But she doesn’t say we shouldn’t, either. Draw your own conclusions, is the most prevalent message here and we’re all drawing pretty much the same one: it’s a race to the finish line and whoever can drink the most cups of coffee, show off the darkest undereye circles or at least sleep the fewest number of hours wins. I’m gonna go ahead and bow out of that rat race. Know why? Since I’ve taken on aforementioned new freelancing project, I’ve been a pretty miserable person to be with. Since it’s taken on a much larger chunk of time and energy than I’d originally anticipated, and it doesn’t appear to be taking as much time or energy from the person I’m working with, I’ve been getting cranky. And who do I crank at, when I’m in my very ugliest of moods? You guessed it: the person I’m working with, who is a dear friend and most undeserving of my attitude problem. So let’s make this a public declaration to climb off the hamster wheel, slow down and accept that we’re all individuals with our own limits, our own measures of success and most of all, our own barometers of where each of those lie. Let’s stop competing with the boys, the clock, the universe, ourselves. Let’s stop hating ourselves for being ourselves, with all of our beautiful individual limits. Most of all, let’s stop giving each other the side-eye if the person next to you is “winning” the stress competition. Because soon enough, there won’t be anyone standing there to take it and then we’ve all lost, on the greatest scale of all. Next Buffalo Steel has launched!